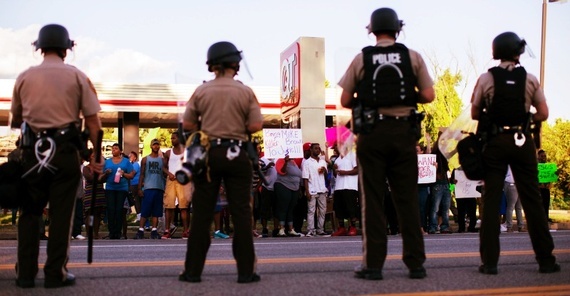 Given case precedence, the eyewitness testimonies of Crenshaw, Mitchell and Johnson will not be enough to convict Officer Wilson of any wrongdoing. If that’s even the right outcome. Let’s do a little experiment and presuppose that we still lived in an era where eyewitness testimony was taken at face value and that it was admissible in court and enough to convict an individual. As that used to be the case. Many of the DNA reversals — getting innocent individuals out of prison — occurred because of faulty and unreliable eyewitness testimony. Anyhow, let’s pretend that it’s a pretty solid indication of a set of circumstances. Josie says Wilson initially saw Brown and his friend walking in the middle of the street, rolled his window down and told them to get over. When they wouldn’t, “he pulled up ahead of them, and he was watching them, and then he gets the call in that there was a strong arm robbery, and they give the description. And he’s looking at them, they’ve got something in their hands, it looks like it could be what – the cigars or whatever, so he goes in reverse back to them,” Josie told Radio America. “As he stands up, Michael just bum rushes him, just shoves him back into his car, punches him in the face. And then of course Darren grabs for his gun. Michael grabs the gun. At one point he’s got the gun totally turned against his hip, and Darren shoves it away. And the gun goes off,” she said. “Michael takes off with his friend, they get to be about 35 feet away and Darren, of course protocol is to pursue. So he stands up and yells ‘Freeze!’ Michael and his friend turn around, and Michael starts taunting him, ‘Oh what are you going to do about it?’ You know, ‘You’re not going to shoot me.’ And then he said all the sudden he just started to bum rush him, he just started coming at him full speed, and so he just started shooting, and he just kept coming,” Josie said. Then we have the following eyewitness reports from Piaget Crenshaw, Tiffany Mitchell and Dorian Johnson (the individual with Michael Brown at the time of the shooting), respectively. The overlapping consensus we see among what Officer Wilson says occurred and what Piaget, Tiffany and Dorian says occurred, is that some sort of struggle occurred near or in the police officer’s car and then Officer Wilson gave chase to Brown. The disagreement primarily seems to be first, what occurred at the beginning of the struggle (to indicate whether Brown was attempting to grab Wilson’s gun or not) and secondly and most vitally, whether Brown was trying to surrender with his hands up or whether, as Wilson has said, Brown charged him. Now, two questions immediately come to mind. Even at 6’4” and 292 pounds, why would an individual, Michael Brown, that apparently ran from an officer with a gun, then decide 35 feet later to turn around and charge this person with a gun? Seems odd to me. The second question, why would Officer Wilson maliciously and purposefully execute an individual in broad daylight in front of onlookers — onlookers sure to have cameras? Also seems odd to me, but there’s at least something we can speak to here about that. I’ve spoken at length about it already in previous posts, so I won’t rehash it all here, but suffice it to say, officer’s practically operate with impunity in terms of facing punishment. I’m not saying Officer Wilson did execute Michael Brown, but it wouldn’t surprise me if he did given that impunity status. Also, doesn’t it seem odd that — and this is also an area where both versions of the event align — Officer Wilson was running and shooting at Brown at the same time? I don’t know what the policy is on that, but it seems fairly reckless. At that point, wouldn’t it be more prudent and not to mention, safe, to wait back and call for backup? Furthermore, it’s been brought forth that Officer Wilson suffered a fractured orbital bone and other injuries. However, in Dr. Baden’s autopsy report, he found no signs of a struggle on Michael Brown’s body. I understand Brown’s a big boy, but flesh and bone are flesh and bone; if you hit somebody with enough force to fracture their orbital bone, wouldn’t that leave some sort of indication that would come to light under the detailed analysis of an autopsy? Again, I’m not a forensic expert or a fighting expert or anything like that. I’m just musing here on the peculiarities of the case. Finally, it still seems unclear exactly if Officer Wilson knew that Brown was the robbery suspect or if he was merely stopping him for jaywalking. However, what is probably clear is this: Even if Wilson didn’t know that Brown was the robbery suspect, Brown likely thought he was being stopped by that officer for that reason. We’re clearly never going to know for sure what occurred at the SUV window or what occurred after the officer gave chase; it’s just too hard to know. 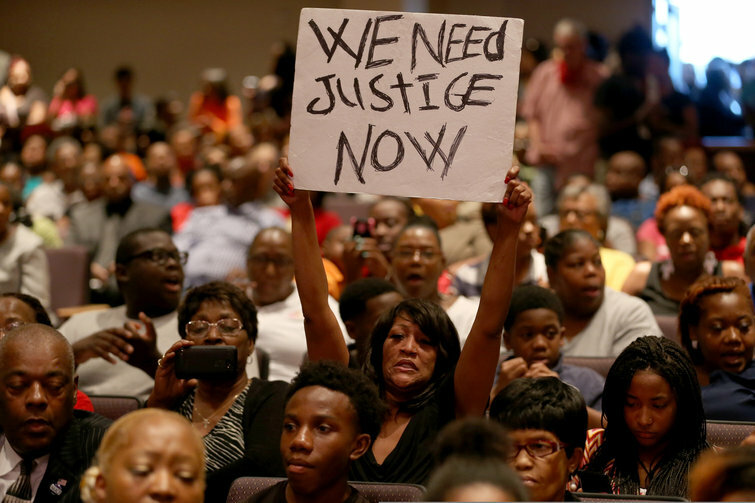 However, given case precedence, the eyewitness testimonies of Crenshaw, Mitchell and Johnson will not be enough to convict Officer Wilson of any wrongdoing. There’d have to be some indication from forensics or somewhere else (some other video or pictures) to lead to that outcome. If that’s even the right outcome.